Contributed by: Rakhamon (morfeus2@hotmail.com). Tsathoggua was created by science fiction and fantasy writer Clark Ashton Smith and first appeared in the story "Door to Saturn". He appeared as a living stone idol guarding the Cobra Crown in the adventure novel "Conan the Buccaneer" by L. Sprague DeCamp and Lin Carter. Later this Conan story was adapted by Roy Thomas and John Buscema in the pages of SsoC. 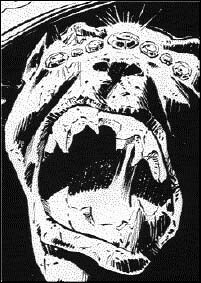 It is unlikely the stone idol seen in Conan the Buccaneer or the comic book adaptation was actually Tsathoggua himself; most likely it was invested with a tiny fraction of Tsathoggua’s true power. With monstrous dooms." - Richard L. Tierney: "Petition: To Tsathoggua"
Appearance: This horrible toad-like being was set to guard a mysterious temple on an uncharted isle outside the Black Coast in eons past. A rude lumpen figure carved of grey stone set with seven glowing orange jewels for eyes, the creature resembles a humanoid toad or frog, with a hideous misshapen head, mottled leathery skin and sharp claws on its limbs. Combat: The toad-thing will attack anyone entering the temple it guards and will not cease until it or its victim is dead. The toad-thing fights simply and savagely, relying on its great strength and ferocity. It moves with great speed for something made of stone and is as strong as one might expect based on its composition. Jump Attack (Ex): As a full-round action, the toad-demon can leap up to 30 feet towards an enemy and then make a single melee attack at +2 to hit and +2 damage. It can only make a jump attack if its target is at least 10 feet away and cannot jump over any obstacle higher than one foot. Immunities (Ex): The toad-demon takes no damage from falling, does not need to eat, sleep or breathe and does not age. It is thus immune to any attacks through these means (such as trying to suffocate it). Habitat/Society: The toad-idol has been set to guard a great treasure on the Nameless Isle. Who summoned it from some unknown hell is not known, but it is believed that the ancient temple in which it dwells was dedicated to the toad-like demon-god Tsathoggua. Ecology: The toad-demon is an unnatural thing, an abomination to all nature. Even experienced warriors have been known to turn and run if they encounter it. It will not stray far from the temple it guards.